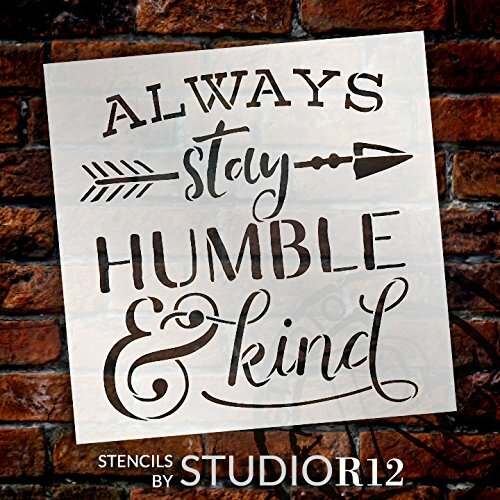 Always Stay Humble & Kind - Arrow - A Fun and primitive stencil by the artists at StudioR12! From crafts to cakes, walls to weddings - elevate your creative potential with stencils! Layer, emboss, revitalize, remodel, & explore a whole new world of artistic expression! Say it with a sign, jazz up a journal, personalize a planner, add flair to furniture, and much, much more. Made from laser-cut translucent 7.5 mil Mylar (BOPET) plastic. Superior to vinyl - durable, non-toxic, chemical resistant, & food safe. Use over and over with proper care & cleaning. Soap & water clean-up. Non-adhesive, easy to position for no-mess use & storage. StudioR12 stencils are created with care in our shop in Ohio, by a team that's passionate about making the best stencils you've ever used. If you want a way to create projects that impress, without spending hours on tedious tracing and hand-cramping hard work, then look no further! • For acrylics or other wet mediums, remove excess from the brush or applicator when loading. Apply mediums in multiple layers, as dryly as possible to prevent bleed-under. • For dimensional mediums (i.e. pastes, frostings for cakes & cookies), apply with offset spatula or palette knife. Remove stencil by lifting straight up. • Wash with warm soap and water immediately after use. Wash before using with food or cosmetics. • Do not use with ammonia-based cleaners, as it may damage the stencil. • Do not expose to excessive heat or flame. • Parental supervision is encouraged. If you have any questions about this product by Studio R 12, contact us by completing and submitting the form below. If you are looking for a specif part number, please include it with your message.